During the Digital Methods mini-workshop that Richard Rogers and Sabine Niederer held for us here in Bergen today I realized that I could quite easily continue my explorations of which words people use about the field of electronic literature using web material. In my Dichtung Digital essay I used Google’s book search to show how the terms have emerged in print literature about the field. One of the problems with this was that e-lit is obviously more discussed online than in print, and that the book search only contains books published until 2008. Some of the tools the Digital Methods Initiative have developed make it easy to look at how the terms “electronic literature” and “digital literature” and others are actually used by using the Google scraper to analyze blogs and websites in the elit field. I hadn’t really thought about that before, but it would be pretty simply: dump a list of authors’ websites (or simply blogs, or journals or other sites) from the ELMCIP Knowledge Base, feed the URLs into the URL field of the Google Scraper and the terms I’m interested in into the keywords field. I tried a very quick version just scraping eliterature.org and dichtung-digital.de for “electronic literature” and “digital literature”, and unsurprisingly there are a lot more occurrences of “electronic literature” on the website of the Electronic Literature Organization. 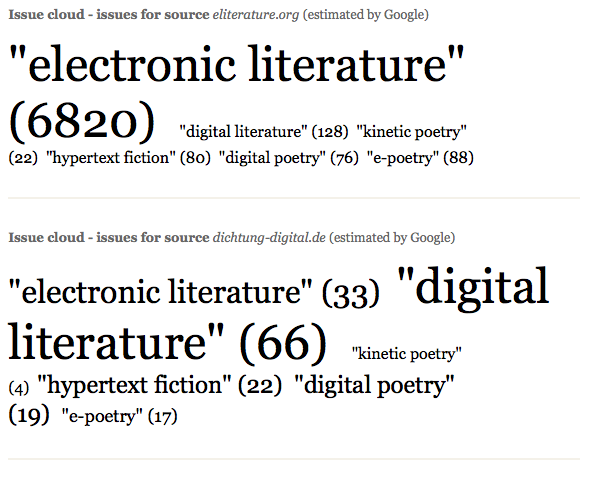 Dichtung Digital, on the other hand, a bi-lingual journal based in Germany, has twice as many counts of “digital literature” as “electronic literature”, which would begin to confirm my impression that “digital literature” is more commonly used in Europe. Obviously there is a lot more that can be done here – but it’s rather lovely to be able to do even that in five minutes, you know? Here are my results. The numbers are how many counts of each term Google found on each site. Another quick and dirty way of seeing how people are using terms is by using Google Insight to graph what people have searched for. 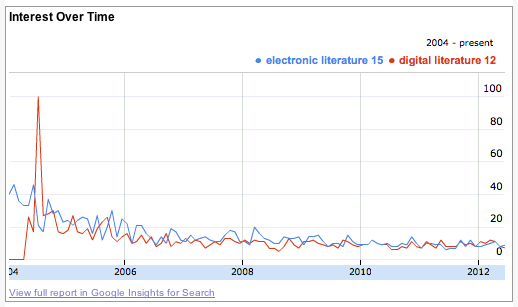 Apart from that strange spike for “digital literature” in 2004 (what happened then?) you can see the two terms are almost exactly equally popular as search terms, although the frequency of searches for both sunk gradually from 2004 until 2006 and then plateaued. (Unfortunately the Google Insights data only goes back to 2004 so I don’t know what happened before that.) The decrease surprises me actually based on the increased amount of activity there seems to be in the field in terms of conferences, seminars and publications. Perhaps people are using different words in search? Or are the people who search for “electronic literature” different people to the people who are increasingly active in publishing and conferencing? So what, you might ask? Well, it’s interesting to see how a field is defined and how the terms used to refer to a field emerge. I think that “electronic literature” is more used in an Anglo-American context and “digital literature” in Europe. I’d also like to know more about developments over time. Richard Rogers noted that it’s usually more interesting to find contrasts rather than searching for as many different keywords as possible. Perhaps when I dig deeper I’ll find that the difference between “electronic literature” and “digital literature” really isn’t the most interesting contrast, or even that there’s not that much of a contrast there. It’s a place to start, though. I also want to try out some of the other techniques mentioned in today’s workshop, like using the Issue Crawler to generate lists of which URLs link to which, and I would like to use their system for getting PDFs of historical screenshots of websites out of the Internet Archive to generate a screencast that shows how they’ve changed over time. There are so many tools available on the Digital Methods site I want to play with.